Why would a genius create such a large book of over 95,000 words for youngsters? Did J.R.R.Tolkien really write The Hobbit just for his children, or was he experimenting, stretching his imagination in his literary world? By all accounts it was probably a bit of both, but I doubt that Tolkien realised what he had created with the Hobbit, that it would become the precursor for a truly epic fantasy tale that is now the stuff of legends. Or, did he plan it that way? I was given a copy of The Lord Of The Rings for my birthday, and I wanted to dive right in, but everyone told me to wait, and read The Hobbit first. Being pig headed at the time, I took no notice, which, as it turned out, wasn’t the smartest decision I’ve ever made. Lifting the book for long periods made my arms ache, which wasn’t surprising with about 1200 pages to hold, and over 455,000 words to read? And yes, I did have a hard backed copy. Yet that wasn’t a big problem as the words jumped out from every page and I began to enjoy myself. Though, If I’d read The Hobbit first, I’d have known more about the precious ring and the dwarves, and I wouldn’t have scratched my head so often wondering what happened previously. I found the long descriptive passages a bit tedious for my tastes, but I ploughed on, and my mind wandered into the tale. Yet, like a fish on a very long line I was slowly being reeled in from the depths and into the light. I began to understand the style, the richness of the words, and the array of wonderful characters that seemed to jump out from every page. I could no longer resist, for I was well and truly hooked reading the leather bound masterpiece. A genius needs flair, a vivid imagination, talent and knowledge. Tolkien had all four, but he also carried out much research which enabled him to choose some unforgettable characters. Here are a few of the many Norse and Old English names in the book. Gandalf – Old Norse – meaning an Elf with a staff. Frodo – A Norse King called Frodi. 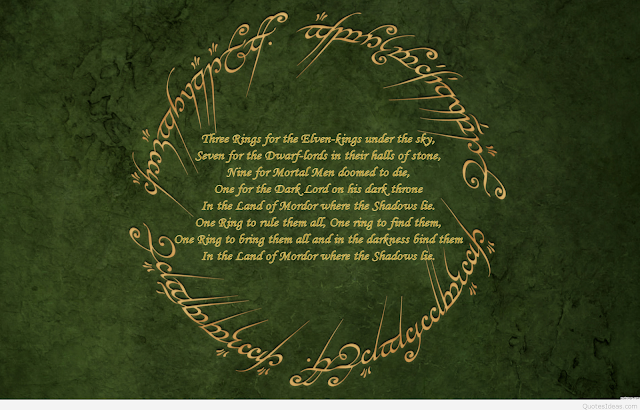 Mordor – Old English – usually meaning murder. Sauron – Old Norse – meaning abominable. Sauraman – Old English – meaning a cunning man. And it’s these names and others that captivated me, urging me to turn the pages. There was many a time when a planned quick read in bed, turned out to be a marathon session into the wee hours of the morning. The depth of the story could only come from a man with an imagination far beyond most other writers of his time, and probably even now. I met others, as bleary eyed as me, all full of praise for the great man. Some said that the book was too long, others that it was too short, but all were of one accord. The book was the best they had ever read, and I didn’t disagree. 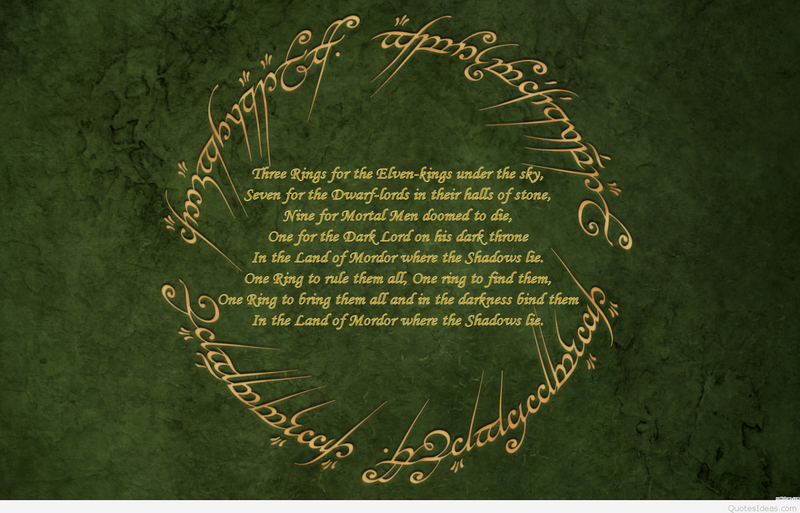 To me, J.R.R.Tolkien is the master of epic fantasy and The Lord Of The Rings his masterpiece. As he looks down from his writing study in the sky, I’m sure he is delighted that so many people love his work, but I am also certain that he never believed his magnificent book would become so successful. But as often happens, not every cloud has that silver lining, especially when the film makers arrive. And just like me, they looked at the big book first. The Lord Of The Rings was a massive hit at the box office, and that’s mainly down to the efforts of the director, Peter Jackson. He wanted those around him to be fans of the book, and to help him make a film that was as close as possible to the original story. It was, and still is, a great film. The casting was brilliant; the storyline mirrored the book, and the special effects were superb. I think Peter Jackson did a pretty good job. The Hobbit was a different matter. Making three films from a short book, only made sense to those wishing to make money, and they did, for greed overcame common sense. The first film was a bore, the second improved, the third better still. I tried to love the films, I wanted to give them the benefit of the doubt, but the harder I tried, the more my disappointment grew. The trilogy was simply way too long. If you want to really enjoy the work of the master, ignore the films, and open the books instead. Let your imaginative juices flow through your heart and soul as you read the words. Naturally I don’t want you to make my mistake, so do read The Hobbit first. Think of it as your hors d'oeuvre. Then you’ll be ready to devour the main course, although a few sessions at the gym to build up your arm muscles may help with your long reading sessions. And once you’ve finished The Lord Of The Rings, leave it for a few months, and read it again. I guarantee that you’ll spot so much that you missed first time around. Tolkien has left a magnificent legacy for all of us to enjoy. I thank you J.R.R.Tolkien, for being my unlikely mentor.